Roth OLi 1 5.1 review | What Hi-Fi? Since its foundation in 2007, Roth Audio has made quite a song and dance in the industry. It was the MC4 valve iPod dock that grabbed our attention, but the iPod systems were followed by a set of stereo speakers from the OLi range that proved equally captivating. 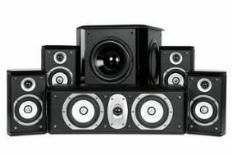 After the OLi1 speakers came the OLi2s at the start of 2009 and the OLi3s; now we're looking at the company's first 5.1 style-speaker system. Of course, beauty's in the eye of the beholder, but we're happy to wave this system through. Yes, the speakers look traditional-ish, but with a gloss black finish, sweetly curved cabinets, fairly compact dimensions – present company perhaps excepted – and a clear nod to aesthetic design, we think they more than merit inclusion here. The new additions to the Roth family come in the shape of the frankly huge OLi C2 centre channel – which even scares away our reference system centre speaker, and the slightly more manageable Oli KH2 subwoofer. Clearly in terms of footprint this is a far more substantial undertaking than some rivals – different strokes for different folks, and while we don't expect this to be as easy for the average living room to accommodate, we're hopeful that the speakers will deliver sonic benefits to counter their size. Certainly there's no arguing with the dynamics, scale and detail. Watching the Blu-ray of Gran Torino, the necessary suspense and excitement are present and correct, while gun shots have serious impact. There's no denying this system gets closer than many rivals to delivering that true home-cinema experience – and what it lacks in style, it makes up for with a thrilling performance. But, while excitement, power and scale aren't a problem, we're not so enamoured with the tonal balance. The top-end is a little too forward and there's a brashness when pushed, too – something we heard in the OLi 1s when we reviewed them as a stereo pair. The Roths don't have the same solidity and cohesion as some, either. So, another good system with plenty of promise but the odd caveat. But what's certain is that when it comes to making the hairs on your neck stand on end and keeping you on the edge of your seat, this system does it better than most.